A Civil War-era doll dubbed Nina lays on an imaging table at Virginia Commonwealth University's Medical College of Virginia hospital radiological center in Richmond, Va., Wednesday, Oct. 27, 2010. Nina and another doll, Lucy Ann, thought to have been used to smuggle medicine past Union blockades, were X-rayed Wednesday, disclosing hollowed papier-mache heads that once could have contained quinine or morphine for wounded or malaria-stricken Confederate troops. AP Photo/Steve Helber. RICHMOND (AP).- Two Civil War-era dolls thought to have been used to smuggle medicine past Union blockades were X-rayed Wednesday, disclosing hollowed papier-mache heads that once could have contained quinine or morphine for wounded or malaria-stricken Confederate troops. Nina and Lucy Ann were taken to VCU Medical Center from their home next door, The Museum of the Confederacy, to see if the contours inside their craniums and upper bodies were roomy enough to carry the medicines. The next step could be forensic testing for any traces of the drugs. The dolls were given to the museum by donors who said they were used to smuggle medicine past Northern blockades to Southern troops. Nina was donated to the museum in 1923 by the children of Gen. James Patton Anderson, who commanded the Tennessee Army of the Confederacy. She has red felt boots. Lucy Ann, attired in a salmon-colored cape and dress, was given to the museum in 1976 by an anonymous donor. She is adorned with a coral necklace. Lucy Ann has an open gash on the rear of her bonneted head, possibly made when its contents were emptied. Nina was likely disassembled then stitched back together. Museum officials believe the dolls were in fact used for smuggling in the Civil War. "In all of the research that I have been able to do, these are the only two confirmed smuggling dolls that I've been able to find," said Catherine M. Wright, collections manager at the museum. 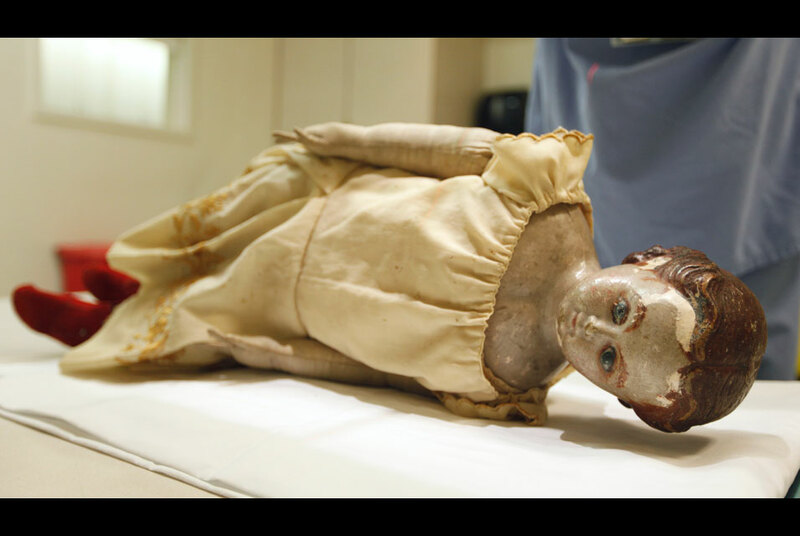 The X-rays were conducted as part of the museum's continuing research of its vast Confederate holdings, believed to be the largest in the U.S.
"People have been so interested in children's toys and dolls from the Civil War in general," she said. "The smuggling aspect is very captivating." Wright carried the dolls, each 2 to 3 feet long, in a box to the radiology department of the hospital. "Looking here, this looks like a cavity in the head and upper chest," said Dr. Ann S. Fulcher, pointing to Nina's image on the screen. "That's probably where the majority of the goods, the medicine, was put." The hospital visit was free-of-charge. The dolls' heads and shoulders are stitched to the bodies, which are stuffed with wool or cotton. Safety pins used to secure their clothing, including undergarments, were visible in the X-rays. The museum knows little about the dolls' silent service to the Confederacy. One theory is that they were purchased in Europe, then shipped to a Southern port with the medicines stuffed in their heads to avoid detection by the North's blockade of Southern ports. "The idea behind the smuggling dolls is that even if a ship was boarded and searched, it was unlikely that they were going to do such a thorough search that they would find this medication hidden inside of dolls," Wright said. The blockade from 1861 until 1865 was intended to thwart the delivery of arms, soldiers and supplies such as medicine to the South. Rhett Butler, the fictional rogue in Margaret Mitchell's "Gone With the Wind," was a blockade runner. A well-known illustration from the period shows a woman tying bundles of medication under her hoop dress for delivery to Confederate troops, Wright said. Once the dolls reached a port, the powdered quinine would be pressed into pills for Southern troops, Wright said. Malaria was widespread among Union and Confederate troops. Some 900,000 Union troops contracted malaria during the war, leaving 4,700 dead, according to the "Medical and Surgical History of the Civil War." Statistics for Southern troops were not compiled but malaria was probably more widespread, said Robert Krick, park historian at the Richmond National Battlefield Park, which includes the site of the Confederacy's largest hospital. Wright, the museum collections manager, was elated after the examination. "This has been really thrilling," she said. "It's not often that you get to research a topic that one else has ever worked with before."